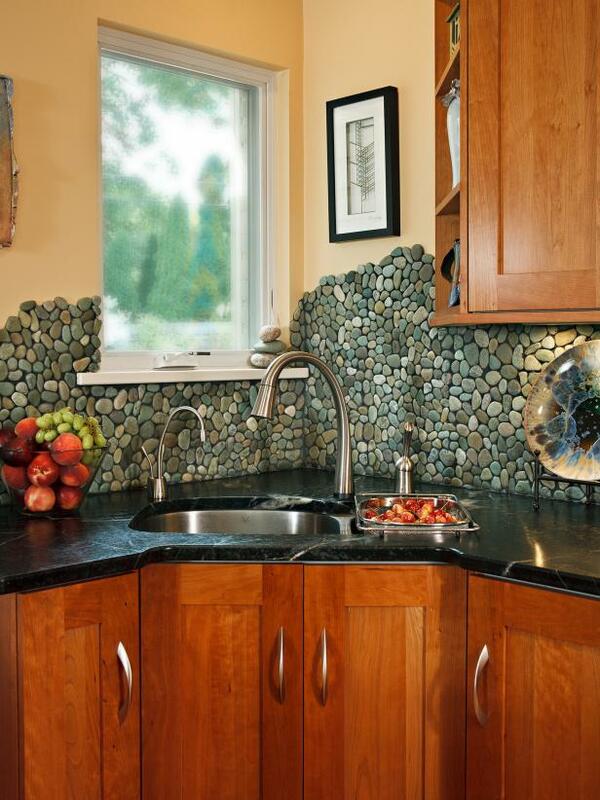 Detail your kitchen with a backsplash that works with your design style. 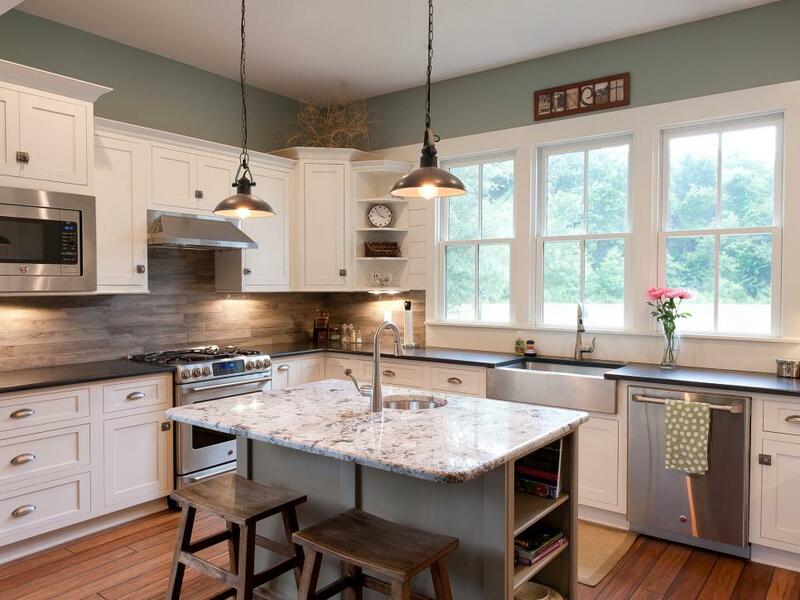 Here, find inspiration and pro tips to finish off your kitchen with flair. 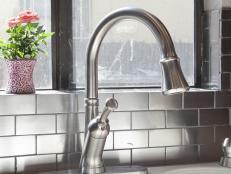 Designer Ann Lowengart offers some advice when deciding on your backsplash. "The one thing you should consider is whether you want to make a statement or if you would rather keep the look clean and quiet. If you want to make a statement, then go for it in terms of color, pattern and/or texture," she says. 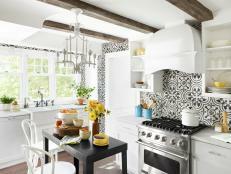 As for the eye-catching encaustic tile used in this kitchen update? "My client really loves making big statements in her design," Ann says. "[She] also wanted all the colors to relate to each other in terms of saturation and create almost a kaleidoscope effect. That goal was definitely achieved!" 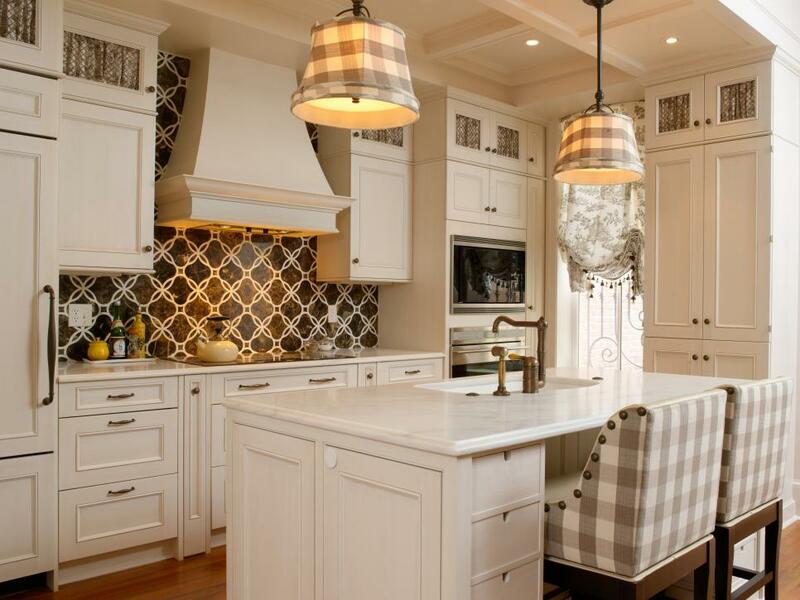 This traditional kitchen design keeps things neutral but plays with pattern as seen in the coordinating plaid lampshades and chairs and trellis backsplash. This keeps the eye moving throughout the room while maintaining a calm, elegant atmosphere. 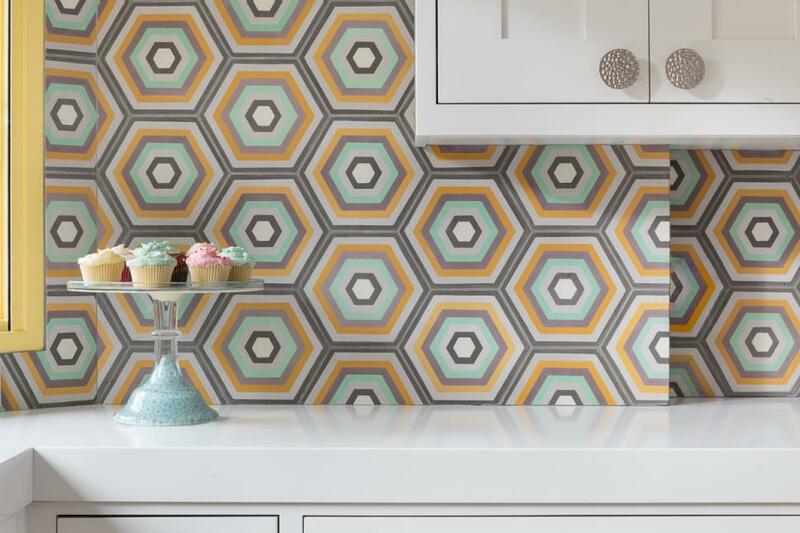 Ready to update your backsplash? "Remember that it is one of the most visible decorative items in the kitchen, so it has a huge impact on the overall look," says designer Shirry Dolgin. 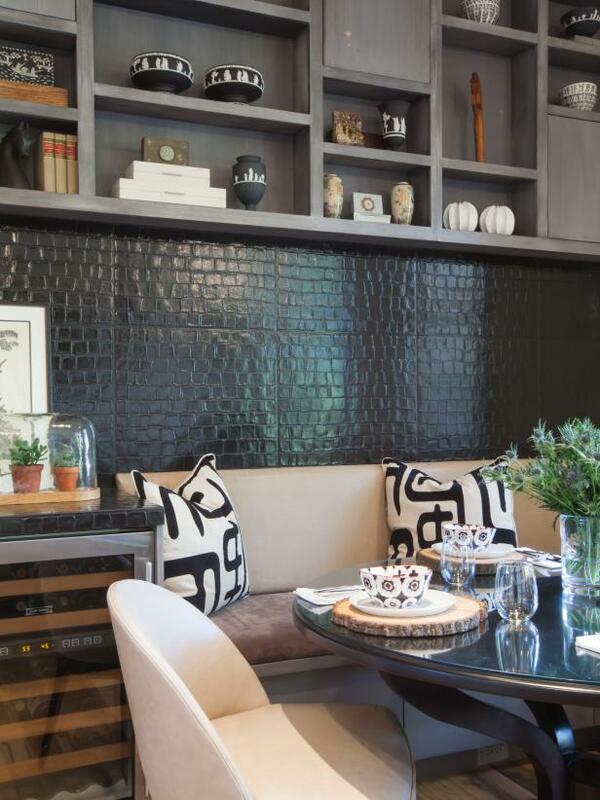 Wonderin how to create a standout backsplash like the embossed-alligator tile backsplash seen here? "I think high contrast or even a strong pattern is really the way to create a statement. One way to do that is to keep everything calm and neutral in terms of finishes for the cabinets, countertops and flooring, and then use the backsplash as the impact material," Shirry says. 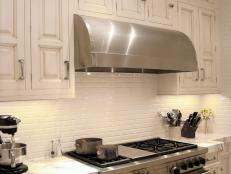 "Unlike in a bar or bathroom, a kitchen backsplash is subjected to heat, grease and a myriad of other potential stains. It should be non-porous and heat resistant," says designer Sarah Barnard. 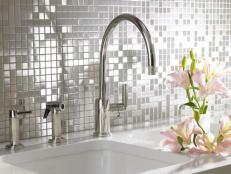 "The best way to have a standout backsplash is to be true to yourself. Rather than playing into trends, honor your true self and personal style." "I searched for small-batch, artisan-made, and ultra-durable materials that would enhance the timeless surroundings," Sarah says. "The gorgeous cast embossed concrete tiles you see were created for floor applications but work beautifully for a backsplash as well. The material is not pigmented; the black lines are the grout we chose to accentuate the other black elements in the kitchen." 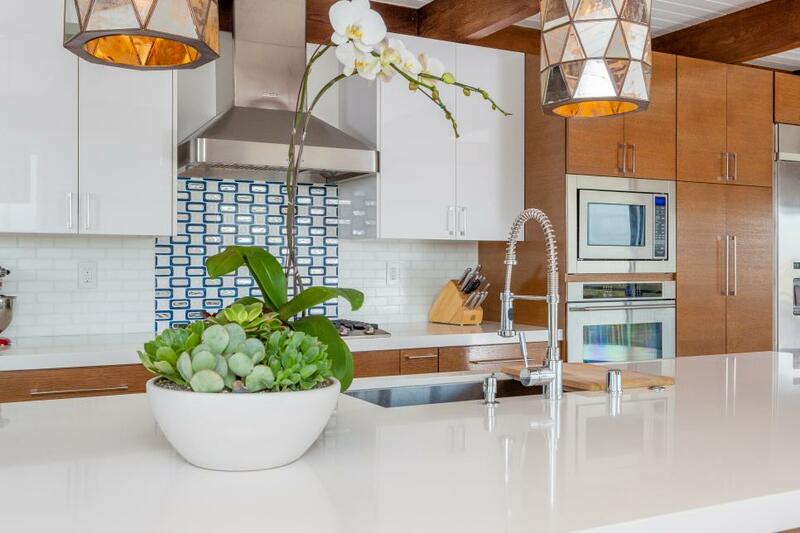 "The backsplash should be fun," says designer Leanne Ford. "Let's call it the 'personality' of the kitchen. And, yes, we all love a clean subway tile, but don’t be afraid to play with marble, soap stone, chalkboard or any other material that gets your creative juices flowing." 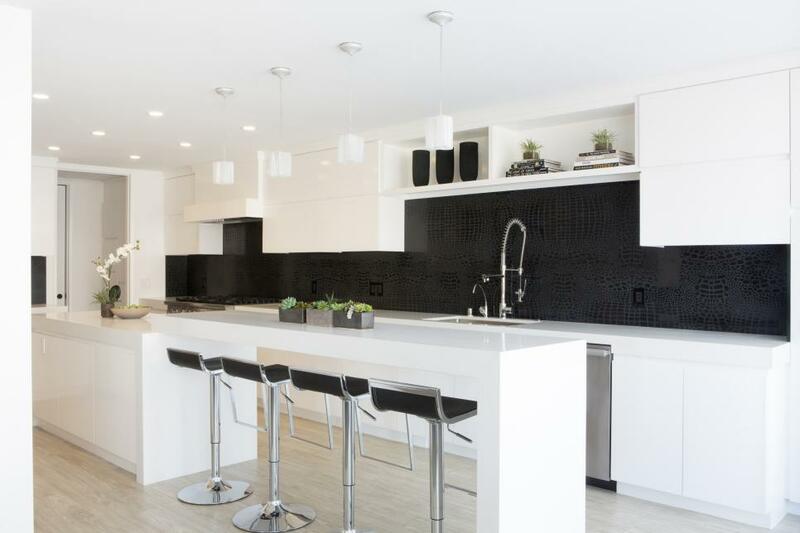 Leanne continues, "Ultimately, your backsplash should be a way for the rest of the kitchen to express itself, and it puts a punctuation on your cabinetry and appliances. Don't be afraid to be a little bold. That being said, don't do anything too trendy, as tile is not an easy switch up. Pick something you won't get sick of and will get better with age." To give this clean-lined kitchen warmth, oak planks were chosen as a rustic backsplash. Though when dealing with a room that is the workhorse of the home, it's important to choose materials that can stand up to constant use. Travis Arnett of Arnett Construction chose the planks for the backsplash of this space, but steered clear of the natural stuff due to durability: "I used Mohawk’s rustic oak plank tiles instead of actual wood," he says. 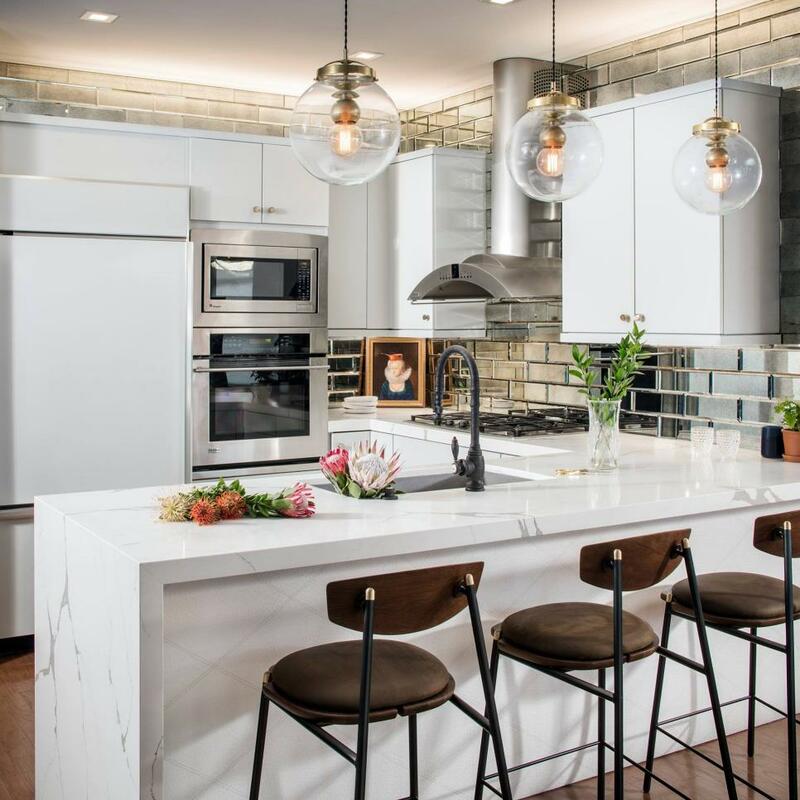 "This beveled, antiqued mirror, subway-style backsplash was an inspiration from one of the client's favorite restaurants, giving an industrial, hospitality feel to an otherwise very simple kitchen," says designer Corine Maggio. 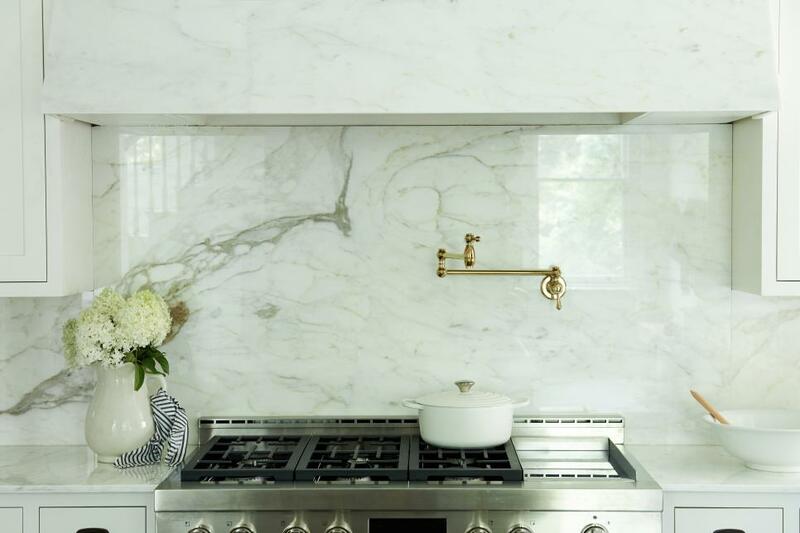 While the shiny surface adds a luxe touch and a more open feeling, there are some things to consider when selecting a backsplash like this. "How often do you cook? Some materials are easier to keep clean than others," Corine says. "Also, the less grout the better from a clean-ability standpoint. If you want a simple and sophisticated look, consider using the same material of your counter as the backsplash." With its pink-and-beige toile wallpaper setting the stage, an ornate cooktop area and gilded, textured backsplash feel right at home. 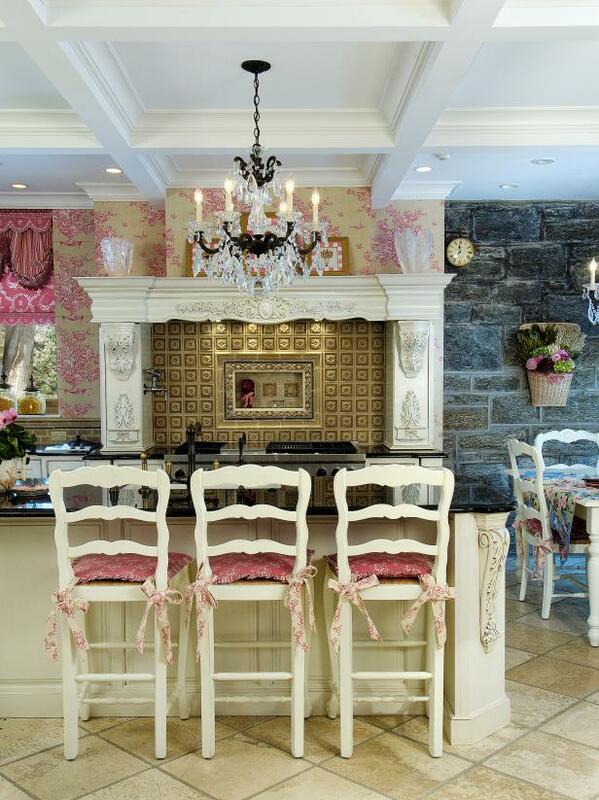 A coffered ceiling, glittering chandelier and pretty seat cushions round out this fanciful, feminine kitchen. A panel of multicolored and patterned tiles adds a delightfully decorative touch to the otherwise stark surroundings in this chef's kitchen. 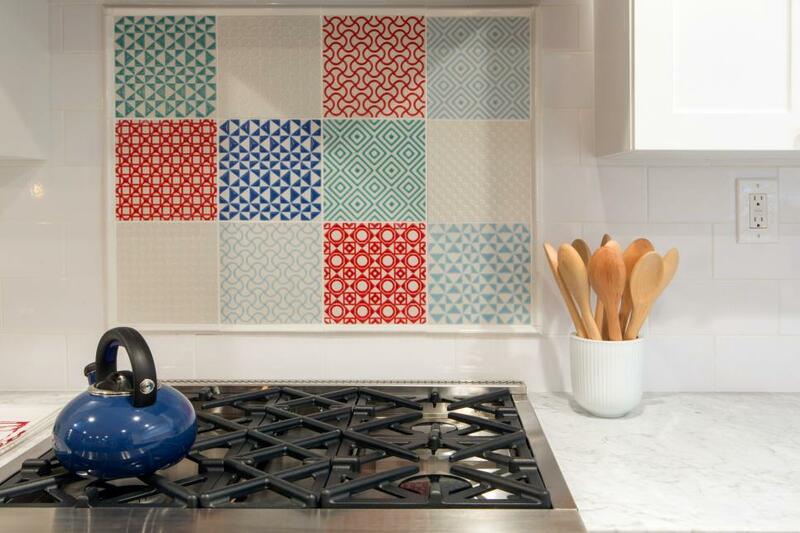 Almost resembling a quilt, this mix-and-match backsplash is a fun way to personalize the space. In this lovely transitional kitchen, hand-glazed arabesque tiles create a stunning background for the sleek, stainless range hood. The diamond pattern in a bevy of beautiful neutrals works to add a bit of soothing color and interest to the scene. 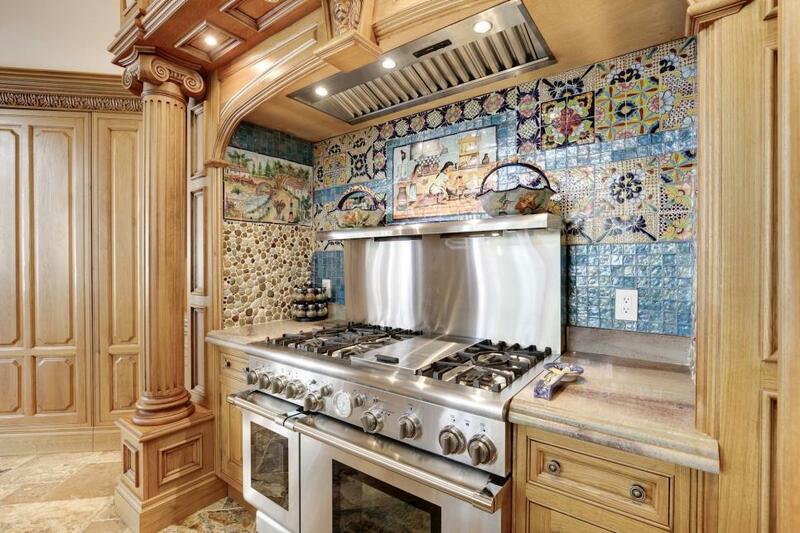 In this elaborate gourmet kitchen, the backsplash takes center stage. 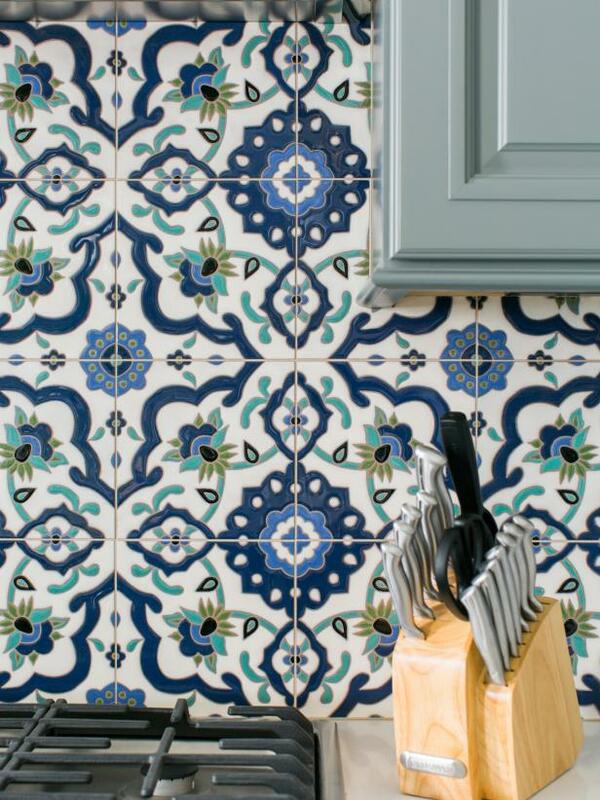 A mix of colorful and unusual Mediterranean tiles creates a cool collage effect, adding real personality to the space. To highlight the collected pottery and unique decorative accessories, the backsplash is in keeping with the global feel. Textured black tiles with an exotic animal print create a leather-like look to the backsplash, completing the kitchen's well-traveled appeal. 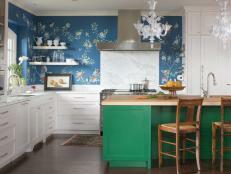 "The backsplash is a great place to add fun, drama and an artistic element to a kitchen," says designer Lauren Rubin. "It is the place to show off your personal touch and bring in a richness to the kitchen." "I believe in color and pattern. If you want the tones to be muted, then a play on shape, size, texture and pattern is the way to go. If you want a pop of color, then keep the pattern simple and bring in your favorites," Lauren says. 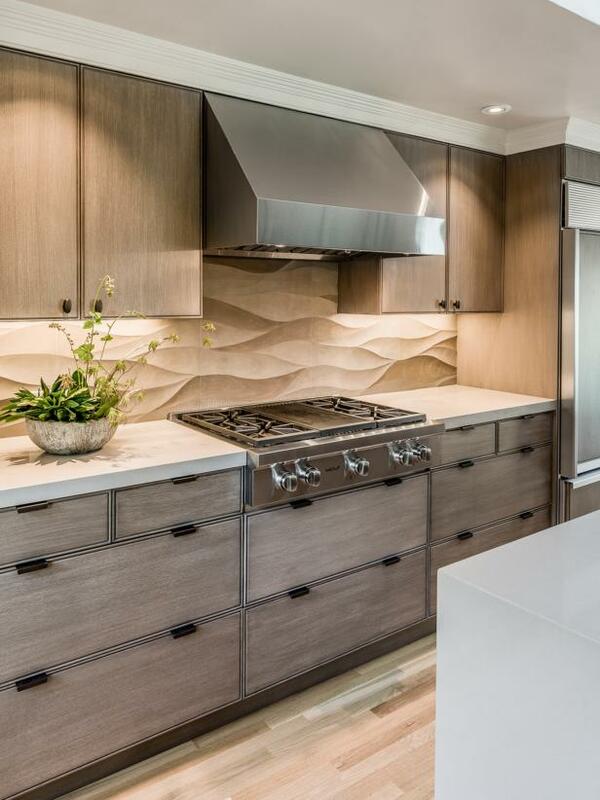 A wavy limestone backsplash provides eye appeal and a nice contrast to the straight lines of the wood of the floors and cabinets in this contemporary kitchen. The neutral, natural stone also plays beautifully against the shiny stainless range hood and stove top, giving the space a sense of movement and bold texture. "This is an original midcentury modern home that I helped remodel from the studs up," says designer Anna-Marie Claassen of Anthology Interiors. "The clients wanted to stick with the original style of the home but in a contemporary way so that it is really livable. The kitchen is a great example of that — it is a very upscale, functional, brand-new kitchen, but we wanted a fun way to nod to the midcentury bones." "This [glass tile] was entirely customized with the colors we preferred, but they had this 1960s shape that just called to me for the backsplash. 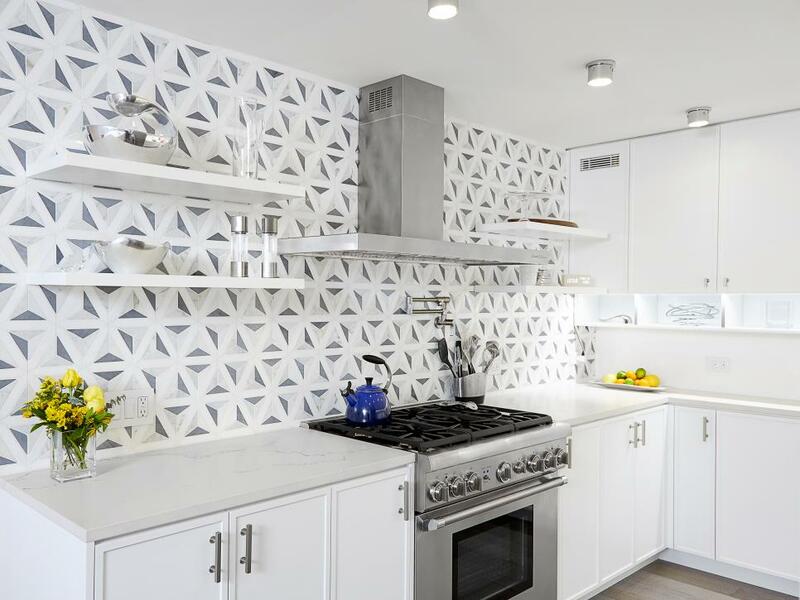 In order to keep it focused, we placed the colorful, patterned tile above the range and continued the neutral white glass tile along the sides of the kitchen. The result is still quite clean and lovely, with a dash of fun," Anna-Marie says. Get island vibes in your kitchen. 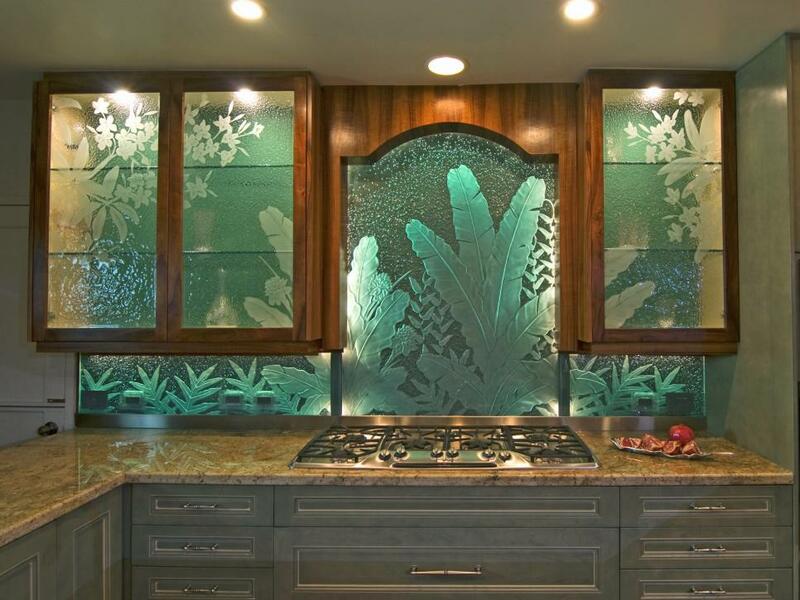 This truly unique backsplash is crafted from kiln-fired glass that's then carved and etched to create a breathtaking tropical motif. 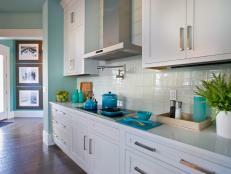 An aqua-colored wall lit by recessed lighting inside the cabinets creates the backsplash's glowing effect. Dark wood cabinets frame the glass art and draw the eye toward this stunning work of art. 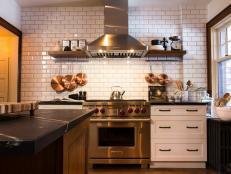 "This backsplash design was the perfect answer to an apartment in an amazing loft in the City Hall district of NYC. The factory was turned into residences, and the apartment still has the original wood floors, soaring windows and beamed ceilings," says designer Lauren Rubin. 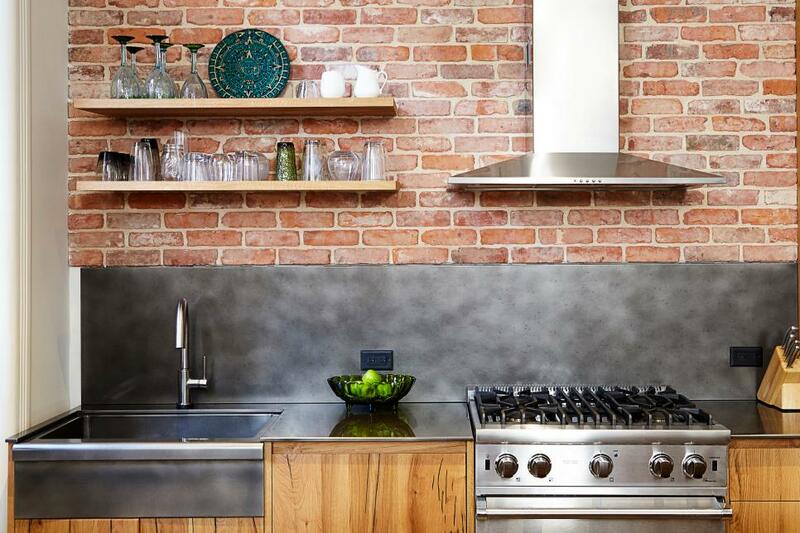 "This backsplash works well with the historic reused bricks beyond. It is sheet metal with a beautiful patina finish." "The cabinetry in this historic loft is made from original train tracks that were repurposed. The bricks were also from a source that reuses old bricks from demolition sites. 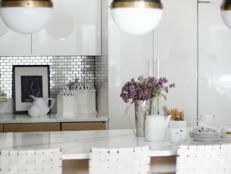 The backsplash had to mesh with these two materials," Lauren says. Adding not just a natural element, river rock pebbles bring a most unexpected and eye-catching texture to the scene. From the unique color gradations to the artsy choice to let the stones' forms determine the shape of the backsplash, this design brings a fun, rustic feel to this gorgeous kitchen. 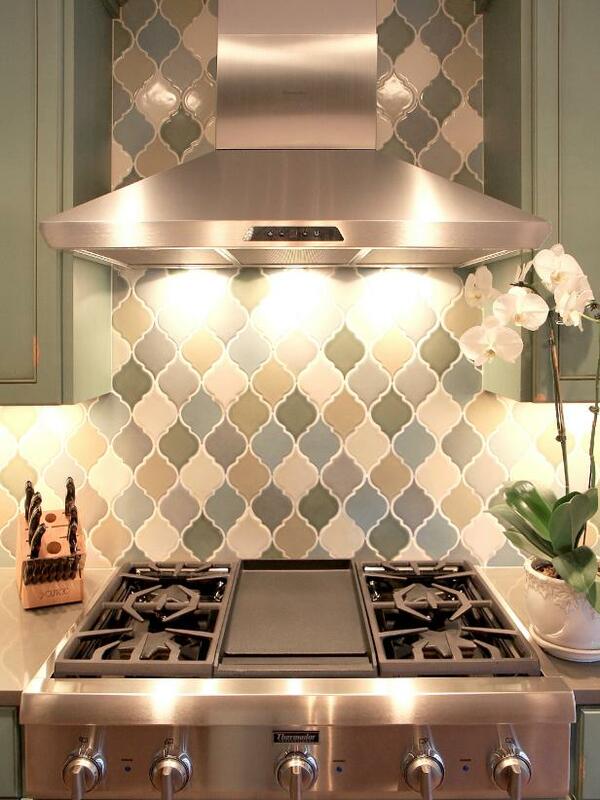 This beautiful backsplash is made up of hand-painted tiles in blue, green, yellow and white. 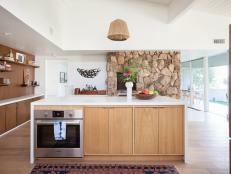 "It gives somewhat of an updated Spanish feel to the kitchen," says interior designer Tiffany Brooks. 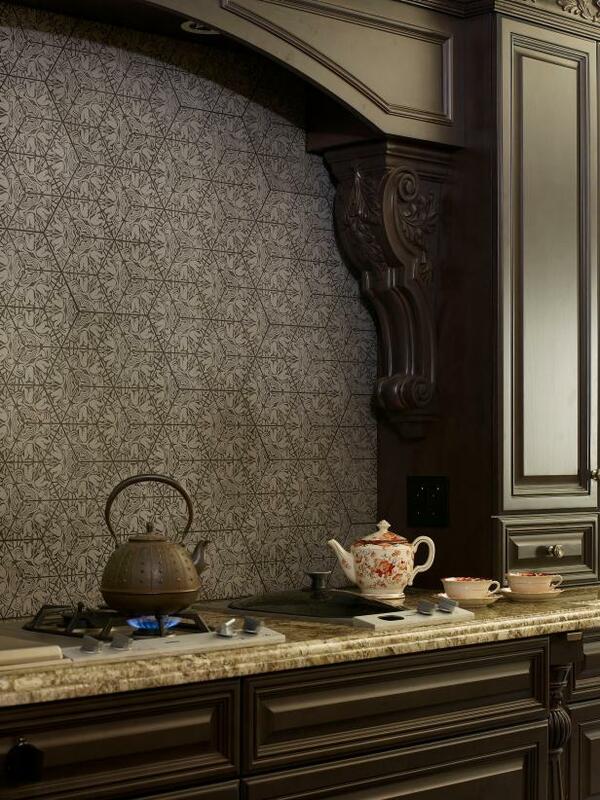 Plus, these stunning tiles make an artsy statement and leave lots of options for cabinetry colors. 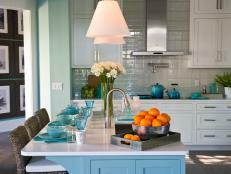 Here, the cabinets pick up on the blue shades of the tiles. 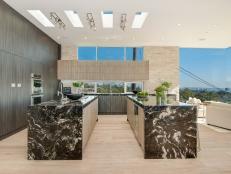 See more of this stunning kitchen here. 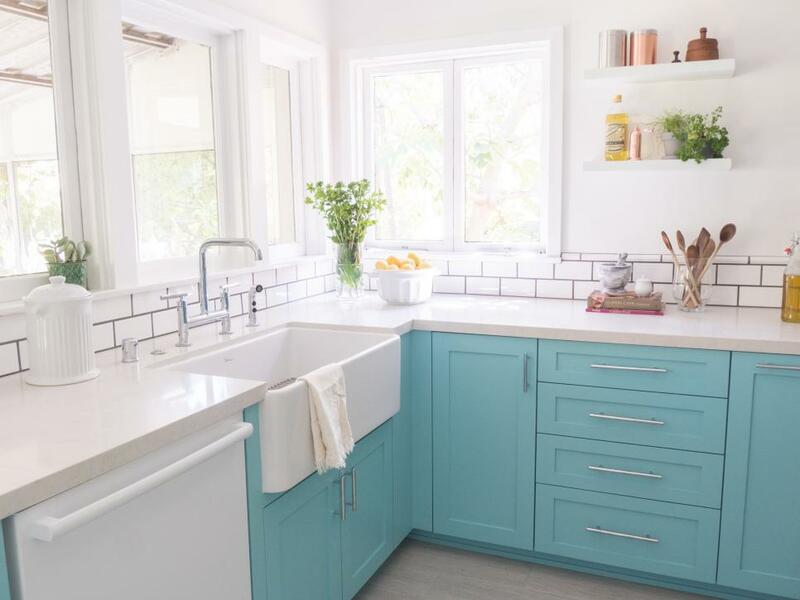 Sky blue cabinets add a bit of peppy personality and country goodness to this clean-lined kitchen. Bright white subway tiles make the most of tons of natural light from the windows, and floating shelves instead of cabinets help keep the look open and airy.